After returning to Seoul from Japan and then a week later finding myself on my way to the airport to board a plane to San Francisco, I found myself wondering, "How many countries have we visited since we left America last July?" and was shocked when I realized that (counting America and South Korea) we'd hit ten. Ten countries in just over ten months. While we're not likely to continue at quite that pace, I think ten gives me a good knowledge base with which to start an "around the world" post. Coffee shops are something I often overlook in my reviews (If not in my Instagrams) but that doesn't mean they aren't a high priority for me or that Dan and I aren't the worst kind of third wave coffee snobs. Of course, in almost all of the cities listed below you can find Starbucks, if that's you're thing or if you're just too jetlagged to risk ending up somewhere that offers you a cup of Nescafe (I'm certainly not above airport Starbucks) but if quality coffee really improves your day, consider searching out one of these. I haven't written much about Prague, primarily because Dan and I were only there for about two and a half days, but that doesn't mean we didn't enjoy it. We actually liked Prague a lot more than we expected given how much we'd heard about how tourist-y and expensive it had become. A critical part of our enjoyment was staying in Praha 2, a bit further away from the tourist-y action but still close enough to choose between walking or public transit to get to all the major sites. Our quiet and cute neighborhood had a lot to recommend it but probably our favorite thing was our proximity to MonOlok, possibly the only Yelp find with which I've ever been happy. The cappuccinos here are creamy with perfectly foamed milk blended beautifully with espresso. The vacuum pots (or as we call them in this house "science coffee") are prepared tableside and if you've never seen this contraption in action, I highly recommend ordering one, it's a fun thing to watch and the coffee is great too. My only complaint is that since it's definitely a neighborhood place they don't open until 10 on the weekends, a bit late for two tourists trying to squeeze the most out of a city in a very limited time frame. We all know that my main goal in Budapest was to eat as much cake and pastry as humanly possible. With much of our days built around where I needed to get my pastry fix in each neighborhood, we didn't really make an effort to find any specialty coffee shops. Our small hotel was also the home to a well known cafe and we used a good portion of our "included" breakfast budget on shots of espresso. While the espresso here wasn't exceptional, it was a solid "good" which is more than can be said of most of the bitter cups I forced down in Vienna. The cafe itself is adorable with pretty good food and pastry and lovely patio (our room was also too cute to handle and had a free mini bar with delicious shortbread and cheesy puff pastry snacks that were restocked daily). I don't know if I'd go out of my way to go there but if you're staying in the neighborhood or shopping on Vaci Utka, it's definitely a good choice to take a break away from the crowds. I really haven't written enough about Western Ukraine's quirky "Lion City". Also known as Ukraine's "Capital of Coffee", Lviv boasts a number of small coffee shop as well as Lviv Coffee Mine Manufacturer. Don't let the mine and its shop's cute branding fool you, it's all style and no substance. For the real deal, my money is one Svit Kavy. Svit has a cozy inside with small tables, mismatched furniture and a bevy of vintage hand crank grinders hanging on the walls. The outside seating area is quite large and a good spot for people watching. The espresso drinks were consistent and beautifully made. The pour overs were sometimes a little weak for our preference but the flavor of the coffee was still good. They have a small number of simple cakes covered in the fruit of the season that were some of my favorite cakes from the whole trip. I think there's a fair number of options for coffee beans for pour overs but since our Ukrainian is pretty much limited to sounding out the alphabet, I'm pretty sure we just got whatever the coffee of the day was. Svit Kavy is just off of Rynok Square, so chances are, if you're visiting Lviv, it will be pretty close to your accommodations and will definitely be close to most site seeing. The cafe is also the only place in Lviv (other than our hotel) I remember having wifi, always a plus when traveling. KRONOTROP. Kronotrop was our best find of the Summer. We passed by on our walk to breakfast one morning and I told Dan that I wanted to come back after we ate. I am SO HAPPY we did. In pretty much all the countries we visited on our honeymoon, iced coffee either meant some sort of weird blended concoction or coffee with scoops of ice cream and heaps of whipped cream. 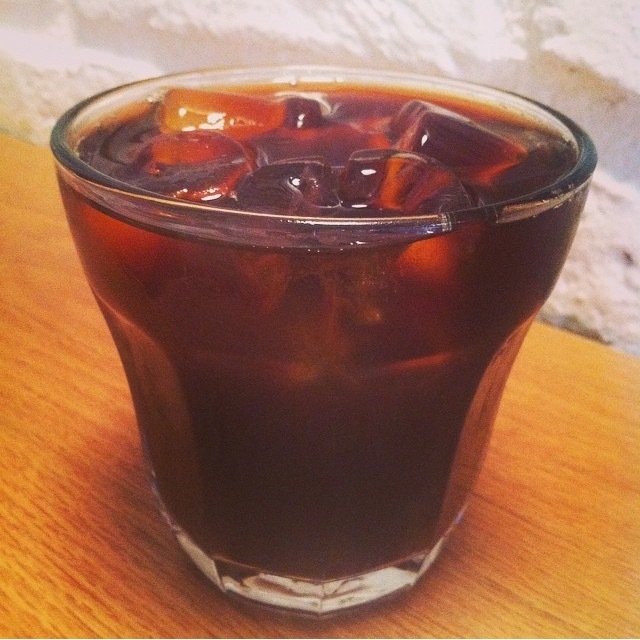 For somebody who mainlines cold brew year round (and extra in the Summer), it was rough. So when we went back to Kronotrop and I saw not only did they have espresso drinks and a variety of hot pour over options but they also had Kyoto drip and cold pour overs, I was basically ecstatic. On a hot, humid, Istanbul Summer day the Kyoto drip was like mana from heaven. Add in friendly and knowledgeable staff, good music and my best friend orange cat and you can bet we were there almost every day of our trip, even when it wasn't really on the way to wherever we were going. Their website also lists a location in Sultanahmet, which probably would've been a good thing to know on our heavy site-seeing days. I'm not sure if the other locations come with extremely cuddly stray cats, but even if they don't, they're worth seeking out to get your coffee fix. Chans Bros (also pictured at the top of this post) is my favorite place to go in my neighborhood and absolutely wins for "most consistent" in Seoul. Even when I order soy milk, the mouthfeel, temperature and consistency of my cappuccinos have always been spot on. The espresso is strong but not bitter. In the Summer, the Dutch coffee (Kyoto drip) is smooth with maple-y undertones. They keep it simple here, no pour overs but I'd rather that than the inconsistency of shops in Seoul with more extensive menus. My only complaint is the same I have of most coffee shops in Seoul, it doesn't open until 10:30 a.m. Sometimes a girl just wants to get up and have somebody else make the coffee, y'know? Millo wins for my favorite roaster and shop in Seoul but I don't go there very often because it's not very close to me and because they don't open until 1:00 p.m. While there are a lot of places in Seoul roasting their own beans and charging a pretty penny for it, Millo is the only place (so far) where the quality of the beans make me happy to hand over my won. The shop is small but comfortable. The menu includes espresso drinks, hot and cold pour overs and Dutch coffee. I'm partial to the cold pour overs here where the unique flavors of their different single origins really shine through. I definitely recommend picking up a bag of beans, they're too expensive for us to use every day but they're always fantastic. I already wrote a full review of Roast when we got back from Thailand. TL;DR version: My iced latte was good, our brunch was fantastic and Dan's single origin pour over was great and came with an adorable tasting card. Located in Thonglor, it wasn't in anyway conveniently located for us but it was well worth the adventure. Since our visit they've now opened a second location. Miyakoshiya seems to have a number of locations all over Tokyo but we only went to the Shimbashi location near our hotel. The Shimbashi location has a decidedly rustic look with lots of polished wood and mismatched tea cups. The first time we went on a week day morning it was empty and they were playing Willie Nelson (my kind of place). We got Guatemala and a Mocha Mattari pour overs. For those not keeping up on their yen to dollar conversions, the Guatemala was just over $7 while the Mocha Mattari was a bit over $10, which is pretty similar pricing to coffee in Seoul. What wasn't similar to most shops in Seoul, was the quality. The Mocha Mattari might be the best coffee I've ever had. I still regret not spending the yen on bringing back some beans. We went back on a weekend day and it was packed and full of smokers (less my scene) and ordered iced coffees. The iced coffees were VERY strong but required quite a bit of milk and sugar to overcome their bitterness. If you go, I'd stick to a week day visit and the single origins. Opened in 1948, with the original owner still roasting the beans (yes, he is literally 100), Cafe de L'ambre is a must visit for its smokey, bar like atmosphere and amazing vintage decor alone. The menu has both single origin pour overs (done with cloth filters) and numerous iced coffee drinks. Even though there is an English language menu, I ended up with a regular iced coffee instead of the "rich iced coffee" I was trying to order. The regular iced coffee is served with coffee cubes which I really appreciated, however similar to Miyakoshiya, it was very strong and very bitter. I prefer drinking coffee black but I added all of my tiny pitcher of milk and a fair amount of simple syrup. Dan successfully ordered the "water drip" coffee which we think was just straight Kyoto drip/Dutch coffee concentrate in a shot glass. Unlike my iced coffee, it was smooth, rich and delicious with an almost fatty mouthfeel even though it didn't have any sort of milk or cream. Dan definitely won at ordering this round. That's it for now. Later in July I'll probably be adding some of our favorite New York places to this list (I don't have any pictures for them now) and in the fall we'll continue on with our travels in Asia. We don't have anything planned for sure yet, but I've got my fingers crossed for coffee in Vietnam sometime within the next year. If you think that I've missed great coffee shops in any of these cities or you just have some great places you'd like to share with the world, please let me know. I'd love to make this list as comprehensive as possible and to throw in some guest writer reviews.